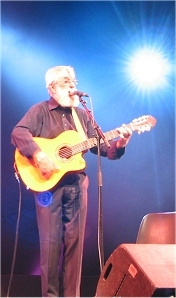 Ronnie Drew - Wikipedia, entziklopedia askea. Ronnie Drew edo Ránall Ó Draoi (Dún Laoghaire, Dublingo konderria, 1934ko irailaren 16a - 2008ko abuztuaren 16a) kantari eta abestigile irlandarra izan zen. Munduan zehar oso ospetsua egin zen "The Dubliners" folk talde irlandarrarekin batera birak eginez, eta banda honekin aritu zen 1995 arte. Ordutik aurrera bakarka aritu zen. 2008ko azaroaren 5ean, Bilbo hiriko Kafe Antzokian Ronnie Drewri omenaldia egin zioten. Han izan ziren Phelim Drew semea —musikari eta aktorea—, Antonio Breschi ("Nomadic Piano"), Consuelo Nerea, Joe McHugh, Gabin Dabiré, Sue Collins, Josu Zabala Ajuriagerra, Jose Angel Irigaray eta Benito Lertxundi. 1967 A Drop of the Hard Stuff (7 Drunken Nights) eta More of the Hard Stuff. 1969 Live at the Royal Albert Hall, At Home with The Dubliners eta It's The Dubliners. Orriaren azken aldaketa: 24 urtarrila 2018, 07:42.